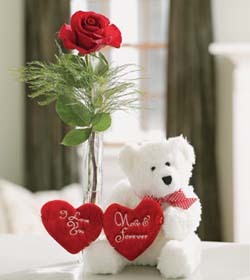 Description: Indulge someone special with this beautiful 9 inches teddy bear,1 pilow and 1 stick of roses. Foods, Cake, Sympathy flower (standing) product is only for Metro Manila, Cavite, Rizal, Bulacan, Laguna, Cebu, Pampanga. *Cavite: ( Bacoor, Kawit, Noveleta, Rosario, Tanza, Imus, Gen. Trias, , Dasmarinas only ). *Rizal Pronvince: ( San Mateo , Montalban/Rodriguez, Antipolo City , Taytay, Angono, Cainta, Teresa, Cardona, Binangonan ,Morong only). *Laguna: (San Pedro, Binan, Sta. Rosa, only ). *Bulacan: (Obando, Meycauayan, Marilao, San Jose Del Monte, Bocaue, Sta. Maria, , Plaridel, Pulilan, , Hagonoy and Malolos City only). *Pampanga: angeles city san fernando and mabalacat. Same day delivery within Metro Manila, Cut off time 10am(Philippines Time). Next day delivery in Province, Cut off time 12pm(Philippines Time). We don't promise any time on delivery day. Our commitment is to deliver your gifts within the day. You must provide complete delivery address. Failure to provide complete address may cause unexpected delayed of your gifts. We will not be responsible for misbeliever because of wrong address, wrong phone # (specified by the buyers), absence of the recipients due to the official day off. If the recipient is not around we may leave the gift to someone who may related to recipient.